What follows is my provisional translation (in other words, not official or authorized; see here for more) of a Tablet that Baháʼuʼlláh revealed as a child to one of His relatives. In this Tablet, Baháʼuʼlláh briefly discusses the innate knowledge He possessed even at a young age by virtue of His station as a Manifestation of God. 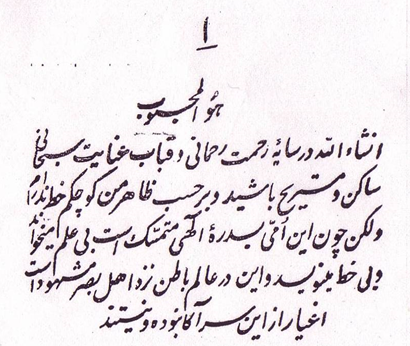 The text of this Tablet appears in the handwriting of the late Tarazu’llah Samandari in Nafaḥát-i-Quds, p. 1. In Maḥbúb-i-ʻÁlam, p. 183, there is a note which states that Baháʼuʼlláh revealed this Tablet when He was “six or seven years old,” but no source is given to substantiate that claim. The Department of the Secretariat at the Bahá’í World Center confirmed the authenticity of this Tablet in a 25 May 2018 letter to Bijan Masumian. God willing, Thou art abiding in the shade of God’s mercy, and reposing beneath the canopy of divine bounty. To outward seeming, I am but a child, and lack the ability to read or write. Yet, because this unlettered One cleaveth tenaciously to the Divine Lote-Tree, he readeth without acquired knowledge, and writeth without having learned how to do so. Unto them that are endued with insight, this fact is clear and apparent in the world of inner realities. All else are not, and have never been, aware of this mystery.